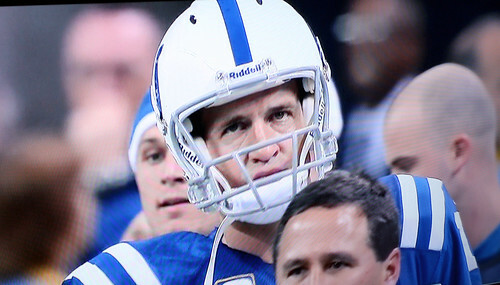 The 5 Stages of Manning Face - Cursed To First - Sox and Pats forever. Before tonight's Wild Card playoff between the Patriots' two most hated rivals began, it seemed like most New England fans on Twitter were making some variation on the "asteroid" or "meteor" comment when asked to pick a winner ("I'm rooting for [insert preferred extraterrestrial object here] to hit the stadium."). If there'd been a way both of these teams could've lost, I believe that's what most Pats fans would've chosen. Given the back and forth right down to the final seconds of this game tonight, you could say that in a way, that's what happened -- at alternating intervals in the final minutes of the fourth quarter, both teams spent time holding a lead, only to be crushingly disappointed. As long as someone had to win, for those of us who hate both teams with a visceral passion, the deciding moments really couldn't have unfolded in a much more satisfying way. With less than a minute to go, Adam Vinatieri hit a 50-yard field goal that left me momentarily paralyzed by cognitive dissonance, to give Indy the 16-14 lead. Then, somehow, the Jets were putting together a drive...and inexplicably, Indianapolis used one of its time outs during that last-minute Jets drive...and then Nick Folk, of all people, was sent out onto the big stage. Folk is approximately the last player in the league I would want my team to be depending on to win a playoff game (now that Mike Vanderjagt is no longer with us). Even though earlier this season he couldn't hit the broad side of a barn with the ball to save his life, in true Jets fashion, he has never lost his swagger! And tonight, from 32 yards out and with 3 seconds left in the game, Folk split the uprights. You could actually hear his primal holler of "YUS!!" on TV the second it went through. It's not like I'm happy for the bastid Jets. Of course not. But there are two bits of good news in this for the Patriots and Patriots fans. First, this means the Patriots don't have to play the Ravens next week. Instead it will be the season's rubber match between the Jets and Patriots, which is not without its difficulties, but I still think Pats v. Ravens the worse matchup from a NE perspective. 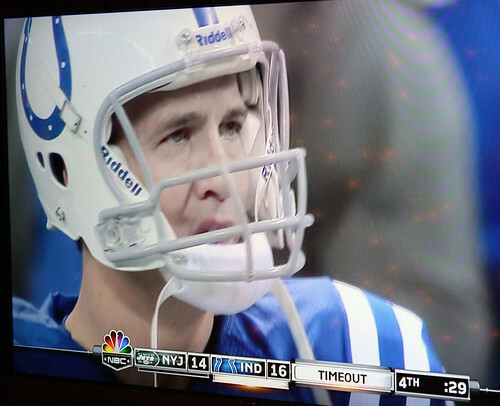 Secondly, tonight gave us what may have been the most exquisite display of the proverbial Manning Face yet. 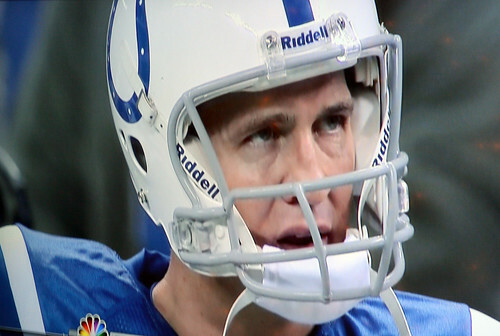 In fact, it wasn't just one Manning Face. It was actually a whole series. 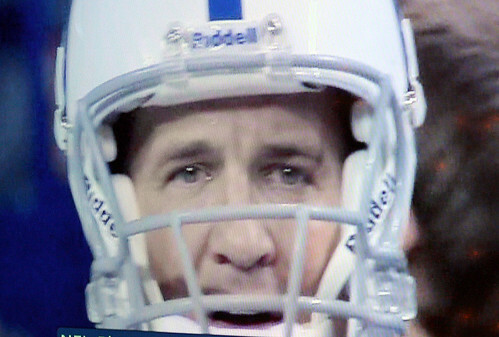 Peyton's reaction to the Colts calling a time out with the Jets in possession during the last fateful minute of the game. The timeout appeared to vex him. 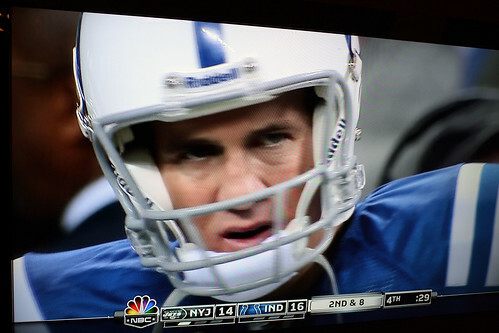 Then, fourth in line, came the Ultimate Manning Face that came first in this post. Here's a closeup.